Wind erosion can affect any land that is exposed to strong wind and has detached soil. There are practical options for preventing or reducing wind erosion in cropping and pasture systems, and some options for treating already eroding surfaces. Maintaining a protective groundcover and a stable soil surface on susceptible soils works well in most areas. Minor wind erosion occurs every year in the agricultural areas, and extensive, serious wind erosion occurs in years when strong winds, poor groundcover and loose soil coincide over large areas. Serious wind erosion is more likely in the second or third year of a run of dry seasons. The Mediterranean climate – cool, wet winters followed by a long, warm to hot, dry summer – has a relatively short growing season. Most agriculture in this area is based on annual crops and pastures – they dry-off in spring (September to November) and are harvested or eaten over summer (December to February), which reduces groundcover and loosens surface soil by autumn (March to May). There are often strong prefrontal winds (wind ahead of rain) in autumn, when groundcover is low and soil has been detached by livestock and vehicle movement or cultivation. There are extensive areas with sandy-surfaced soils – these are very erodible sands with low levels of clay. They have poor structure and are easily detached. Assess and manage wind erosion risk at each stage of the cropping year. do not graze the stubbles and keep traffic to a minimium. Going to pasture, leave about 1500 kilograms per hectare (kg/ha) of anchored stubble after harvest. This will leave about 1000kg/ha of anchored stubble by the beginning of autumn to give 50% cover during pasture establishment. Going to crop with full-cut seeding, leave about 2250kg/ha of anchored stubble after harvest. This will leave about 1500kg/ha of anchored stubble by the beginning of autumn to give 50% cover during crop establishment. Going to crop with zero tillage, leave about 1125kg/ha of anchored stubble after harvest. This will leave about 750kg/ha of anchored stubble by the beginning of autumn to give 50% cover during crop establishment. Going to pasture, leave about 1000kg/ha of anchored stubble after harvest. Going to crop with full-cut seeding, leave about 1500kg/ha of anchored stubble after harvest. Going to crop with zero tillage, leave about 750kg/ha of anchored stubble after harvest. the increased risk of wind erosion if control leaves bare ground. This period is usually the highest risk (likelihood and impact) time of year for wind erosion: dry groundcover vegetation from annual crops and pastures is at its lowest level, prefrontal winds can be very strong at this time, and preparation for seeding and following operations tends to expose and detach soil. early sown canola crops need low stubble loads to get good establishment. 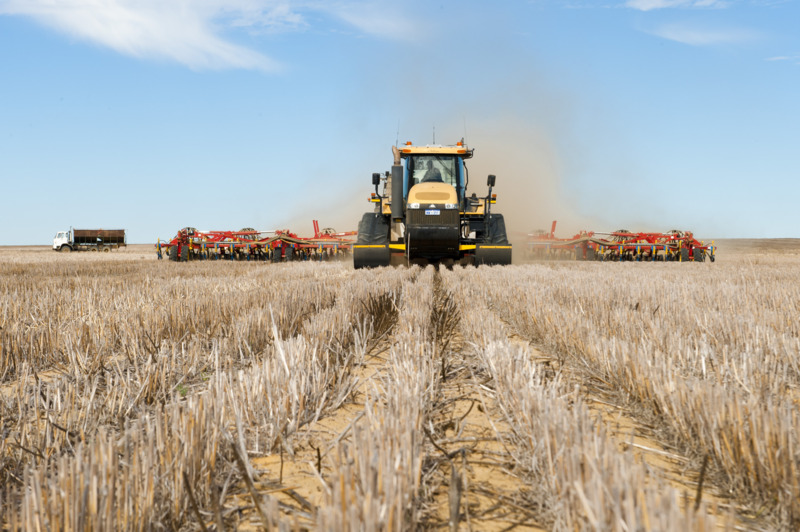 We recommend using controlled traffic farming (CTF) for minimum tillage systems to reduce soil disturbance and the area affected by soil compaction. Note: CTF where grade banks have been removed and tracks are up and down slopes increases the risk of water erosion. Broad-based banks are recommended for that situation. Any form of cultivation will increase the risk of wind erosion. Soil inversion – for example, mouldboard ploughing – can greatly increase the risk of wind erosion. Use weather forecasts to choose safe periods for soil inversion, and plant into moist inverted soil as soon as possible after inversion to reduce the wind erosion risk. All pastures should have at least a 50% anchored plant cover. This equates to about 750kg/ha of dry residues needed at the break of season. Use feed budgeting in late spring to calculate grazing pressures to stay above the target groundcover levels. Protect areas of heavy sheep traffic: laneways, watering points, sheep camps. Remove all livestock before groundcover drops to 50% or 750kg/ha, or when erodible bare areas develop. Use confined feeding on low erosion risk areas. Defer grazing of pastures during early pasture establishment. Plant windbreaks or shelterbelts around highly susceptible areas. Where suitable, plant perennial pasture species, which have a stable base and rapid growth on early rains, to provide better protection from wind erosion. Three factors are needed to result in wind erosion, and there are management options for each (Table 1). We recommend keeping at least 50% of the soil covered by stable crop or pasture residues. Stable groundcover reduces wind speed at the soil surface, physically covers the soil surface and captures any soil particles picked up by the wind. At least 30% of the groundcover needs to be anchored to prevent the rest of the groundcover from being blown downwind. With this level of groundcover, even loose soil will not move in most strong winds. Wind erosion can still occur in small bare areas in otherwise well-covered paddocks, leading to severe blowouts. The most common hazard spots are sheep camps, previous erosion areas, gateways, around watering points and along fences or laneways. These areas need special protection, such as binding spray, clay, gravel, old hay or straw, to give a full cover. Claying is a good option on very susceptible sands that also suffer from water repellence (Figure 1). However, claying is an expensive option when done at the higher rates and it has technical risks. We recommend you obtain advice from a professional or experienced operator before choosing this option. Spread clay-rich subsoil at about 75–100 tonnes per hectare to control wind erosion; higher rates are recommended to give the long-term benefits of reduced water repellence, improved water and nutrient-holding capacity, improved pasture use and reduced risk from frosting in some circumstances. Leave clay on the surface over the summer when the wind erosion risk is at its highest, and incorporate the clay into the top 5–10cm before seeding. Incorporation is needed to prevent clay forming a surface crust that reduces seedling establishment and water infiltration. Gravel can be spread at the same rates as clay spreading to get a stable surface (Figure 2). Gravel is preferred over clay on very susceptible and difficult areas, such as water trough aprons and at gates where livestock tend to congregate. Gravelled areas will drain well when it starts raining. Chemical stabilisers (for example, hydromulch, DustBloc®, Dustex®, GluonTM) will give short-term dust control. These chemicals are expensive, at more than $1000 per hectare. Dustex® and GluonTM require water at 1 litre per square metre (10 000 litres per hectare). Note that the crust they form is easily broken by any form of traffic. Cultivation has the potential to increase erosion and is not recommended in sands. However, delving clays to overcome water repellence can lift large clods (greater than 2cm in diameter) that protect the soil from erosion by reducing wind speeds at the soil surface. Delving requires experienced operators. Too much clay or the wrong type of clay brought to the surface can be detrimental to the following crops. Ploughing heavy soils (clay and loams) to bring up clods will stabilise eroding paddocks, particularly where the subsoil is moist. One sheep can detach hardsetting soil at a rate of 0.3 tonnes per week and sandier soil at a rate of up to 1 tonne per week. Over summer, this can loosen up to 60t/ha on the heavier soils and 140t/ha on sands. 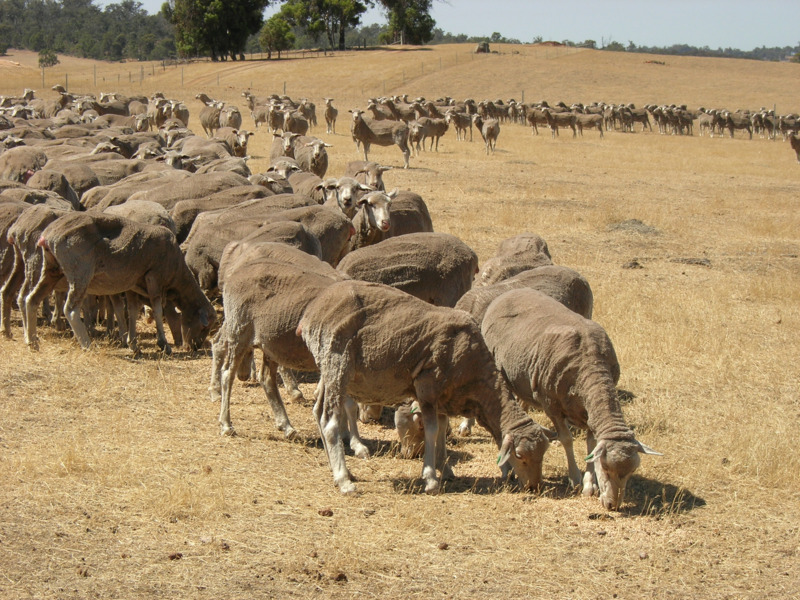 We recommend reducing or removing livestock on areas approaching the target groundcover. In this condition, livestock may have to be agisted, kept in feedlots or stable refuge areas or sold. Feeding trails on paddocks with low levels of groundcover will increase the risk of soil erosion. We recommend confined paddock feeding and feedlotting in this situation. Reduce vehicle traffic wherever possible. Vehicle traffic reduces groundcover and detaches soil. We recommend using controlled traffic (tramline) farming for minimum tillage cropping systems to reduce soil disturbance and the area affected by soil compaction. Any form of cultivation will increase the risk of wind erosion. Soil inversion (mouldboard ploughing is an example) can greatly increase the risk of wind erosion. Use weather forecasts to choose safe periods for soil inversion, and plant into wet, inverted soil as soon as possible after inversion to reduce the wind erosion risk. Tree windbreaks are a durable and effective way to prevent erosion for highly erodible soils in areas exposed to highly erosive winds. This is good insurance for extreme years. 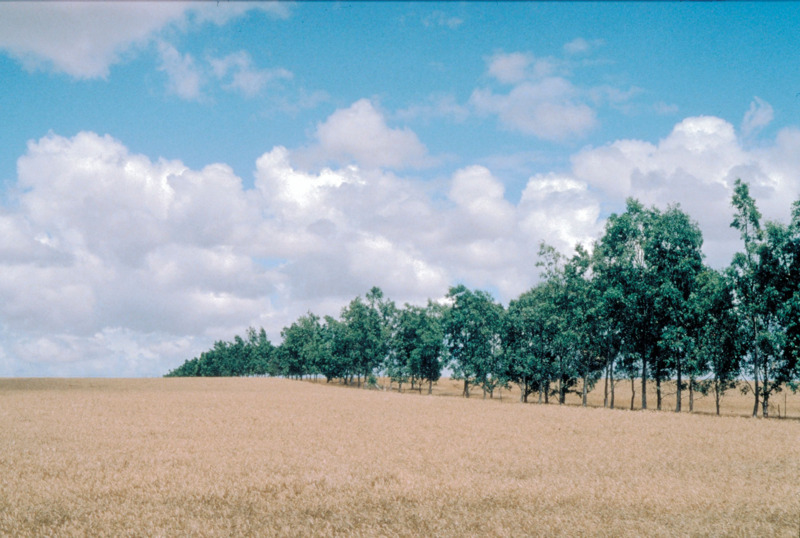 Tree windbreaks reduce erosive winds for 10–15 times the height of the windbreak when winds are at right angles to the windbreak. For a 10m high, well-designed windbreak, the erosion risk is minimal up to 150m downwind. Wind speed gradually increases over the next 10–15 tree heights, at which point the wind speed returns to that upwind of the windbreak. Windbreaks also help to retain detached residues that may otherwise be blown away in strong winds. Tree windbreaks will compete with crops and pastures for light, water and nutrients: design the windbreaks to minimise this. Windbreaks are a long-term capital commitment and we recommend you get good advice before designing and planting tree windbreaks. protect highly susceptible and valuable areas – gateways, laneways, yards, surrounds of houses and sheds – with binding spray, clay, gravel, old hay or straw to give a full cover. Encourage pasture recovery or establish cover crops to reach and maintain target groundcover. Soils that have been eroded are often more susceptible to wind erosion in the following summer. Eroded paddocks usually recover slowly because erosion removes nutrients in the topsoil and the seed reserves of grasses. Paddocks in this condition are very susceptible to more erosion at the break of season. establish cover crops on the most eroded and susceptible areas (see cover crops section in Wind erosion control after fire) and graze to allow pasture species to develop.